5-seater rattan garden furniture corner sofa set table, white weave, blue cushions. Patio conservatory. Ready assembled. 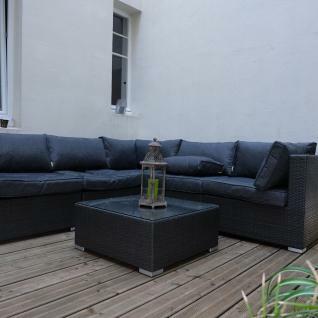 Manufactured in polyrattan, the Napoli garden sofa set is both modern and chic. 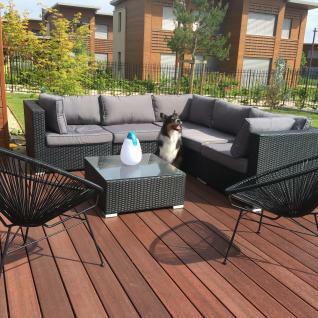 Polyrattan is a trendy and durable material that resembles natural rattan, without any of the maintenance or weather resistance issues that come along with natural rattan furniture. The piped finish of the cushions adds an extra touch of class. The Napoli seats and backrests are padded and the armrests are 12cm thick to ensure superior comfort. The Napoli set can be set up both indoors or outdoors. Alice's Garden carefully selects the quality of the material chosen for the polyrattan. As a result, the life of the Napoli is exceptional! Alice's Garden polyrattan is resistant to sunlight and bad weather (snow/rain/salt water). 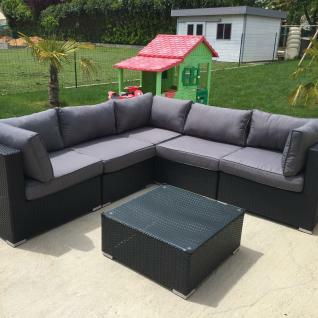 The cushions are removable and waterproof. To prevent rust from developing, the metal structures are made of reinforced aluminium. The glass top of the coffee table is made of 5mm thick frosted tempered glass. We offer a cover compatible with the Napoli that protects it from the elements and winter weather. Click here to see it in our online catalogue.